The terror attacks that struck Paris on Friday 13th November could "easily" happen in London, the Defence Secretary has warned. And he insisted the only way to deal with Islamic State extremists was by force. However Labour opposition leader Jeremy Corbyn remains unconvinced and says attacks on ISIL would make Britain a target. In the meantime hackers and those using social media feel that DDoS attacks and the photoshopping of images may be the answer to defeating the terror group. Michael Fallon said the threat to Britain from the militants, also known as ISIL [Islamic State of Iraq and the Levant], was as "potent" in the UK as it was in the French capital where 130 people were killed and 368 injured. "More than 750 extremists from this country have travelled to Syria, and the growth in the threat shows no sign of abating," Fallon told the Sunday Telegraph. "We are seeing plots against the UK directed by terrorists in Syria, enabled through contacts with terrorists in Syria, and inspired online by ISIL's sophisticated exploitation of technology." Fallon insisted that ISIL would only be beaten by force but admitted it would be harder to get the support of the Commons if Labour leader Jeremy Corbyn ordered his MPs to vote against air strikes [Telegraph]. Meanwhile BBC political correspondent Carole Walker said Michael Fallon had been encouraged by his conversations with Labour MPs over the weekend, with many suggesting they would vote on the merits of any government motion whatever the party line. Concerning the upcoming vote in parliament, PM David Cameron said, "I hope that when the choice comes people will indicate that this is the right thing for Britain to do. It is and we should do it." Cameron who is in Malta to attend an emergency EU summit in Brussels on Europe's migration crisis, meanwhile confirmed that ministers were continuing to hold talks with backbenchers of all parties over the weekend [Sky News]. The threat to London and other cities remains high, especially after Paris. It is believed that at least 450 radicalised Britons have returned to the UK from Syria. While Britain's Intelligence services attempt to identify and monitor those individuals security has been tightened on Britain's streets. Special forces have been deployed on the streets to monitor stations, shopping centres and key public places amid fears the UK could be the next target for an ISIL terror outrage [Telegraph]. And while politicians debate whether or not to target ISIL militants in Syria, hackers and other people using social media have begun their own propaganda campaign ridiculing the Islamic terrorists. The hacking group Anonymous has vowed to hunt down members of the terror group and take down websites and social media accounts. Meanwhile creative users of imageboard 4Chan have decided to fight back with humour using rubber ducks [Telegraph]. 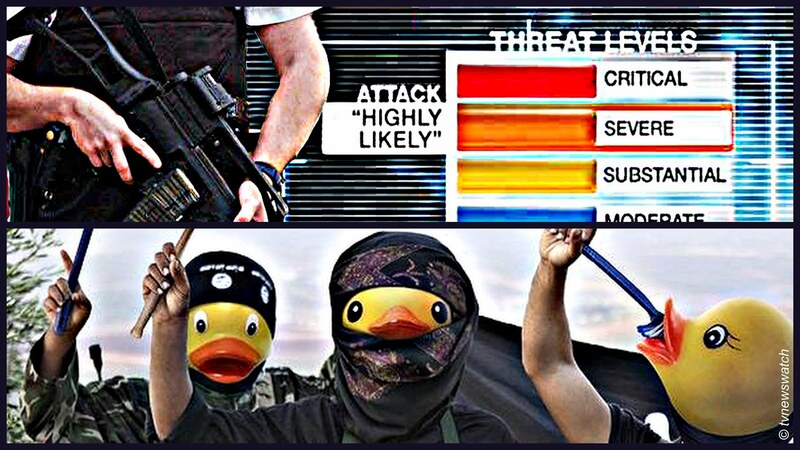 Images of Islamic State militants were soon being posted with photoshopped head of rubber ducks. "This is how we fight Daesh. Humiliate them," one person wrote on one post. The campaign may be amusing but the idea that a terror might be brought down by photoshopping duck heads onto terrorist is evidently quackers.